Each summer, in addition to welcoming our friends from away, the team at Casco Bay Lines is joined by at least one summer intern. Say hello to Stephen! For this week’s blog, we handed him the mic to hear all about his first time cruising Casco Bay! Hi everyone! I’m happy to be joining this incredible team – even if it’s just for the summer! 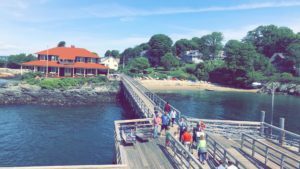 I am currently studying sales and marketing at Plymouth State University and I couldn’t think of a better way to put my studies into action (and enjoy summer on the Maine coast) than helping to market Portland’s iconic ferry, Casco Bay Lines. Born and raised in Portland, I grew up with those red, yellow, white and black ferries chugging along in the background of my childhood. It wasn’t until my first day on the job here that I realized I’ve only ever taken a ferry to Peaks Island for the day. I had never taken advantage of any of the other awesome options for getting out on the water. And, when Caity (CBL’s Sales Director and resident Jill-of-all-Trades) heard I’d never taken one of our specialty cruises, she quickly moved that to the top of my “To Do” list. Market research! So, on a recent sunny Saturday, I packed a backpack with lunch and some sunscreen and took advantage of the great weather to collect some qualitative data first-hand! There are so many different cruises to choose from. And they’re all a little different. For me, the choice was easy. I needed to find out why locals consider the Mailboat Run the best kept secret in Portland. How had I missed this? of Casco Bay. It was really cool to see Portland’s working waterfront from this angle—lobstermen hauling traps and cargo ships chugging in. I even got to see some of the wildlife that calls Casco Bay home; a few seals and cormorants splashed around as we glided down the bay. The trip was a huge success. And I’m even more excited to spend my summer working with the team at Casco Bay Lines, learning the ins and outs of marketing a place as beautiful as Casco Bay!